WorkFit is a partnership between Advanced Therapy and Sports Medicine and Barton Community College dedicated to reducing work-related injuries and associated costs for employers. This comprehensive testing procedure utilizes 28 medical measurements to provide objective baseline data about an employee's maximum performance. 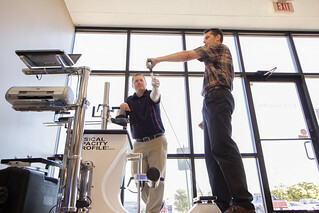 Our testing machine is located at Advanced Therapy & Sports Medicine, 4801 10th Street in Great Bend, Kansas. WorkFit has been offering the Physical Capacity Profile® (PCP) testing procedure in Great Bend and the surrounding area since 2006. The procedure is ADA, EEOC, and HIPPA compliant, and the test reports have been used successfully by companies to reduce settlements in workers' compensation cases. Does your new hire really have the strength or fitness needed to do the job for which you are hiring them? Is your new hire bringing an old injury/liability to their position in your company? Is your employee ready to return to the same job after injury? The patented Physical Capacity Profile® Testing System provides the definitive answers to these often unanswerable questions. Our service is designed to assist employers in preventing work place injuries by properly matching their employees’ physical abilities to their new job. Utilizing state-of-the-art, proprietary software, the PCP machine completes a collection of multiple strength measurements in as little as 30 minutes with results available to employers within minutes. ​Providing pre-injury baseline measurements on an employee allowing treating professionals to expedite the rehabilitation process.